Twenty-seven years ago, Pope John Paul II introduced World Day of the Sick. It’s a day to pray for those suffering from illness. Today, we invite you to join us in praying for the sick and their caregivers. Below are specific prayer requests to help guide your time. Right now, the Ebola virus is devastating communities in the Democratic Republic of Congo. At the same time, people are fleeing violence, making the situation even more deadly. Hundreds of Congolese refugees cross into Uganda every week. Medical Teams is on the frontlines, screening refugees for Ebola at the border. Staff are working hard to ensure that if Ebola crosses into Uganda, refugees will be treated quickly and safely. Pray for the health of refugees as they cross the border. Pray for stamina, courage and protection for health workers on the frontlines of a potential Ebola outbreak. A Medical Teams health worker screens for disease at Kyangwali settlement, Uganda. This time of year is especially difficult for Syrian refugees in Lebanon. Winter weather wreaks havoc on their flimsy homes. In cold, wet conditions, common illnesses can become life-threatening. We’re training refugees to care for the health of their neighbors and help refer people to care. Pray for Syrian refugees, that they feel reassured and comforted by the loving care they receive from our trained refugee volunteers. Rohingya refugees are living in crowded conditions in Bangladesh. The close quarters and huge population can be a breeding ground for disease. Children – who make up a large part of the population – are especially vulnerable because their immune systems are still developing. Pray that our team of Community Health Workers can reach more families with health messages about how to prevent disease. Pray that symptoms in children are caught early and families can get to clinics to be treated quickly. Salamot’s grandma took him to a Medical Teams clinic to get vaccinated after learning about the importance of vaccines from a Community Health Worker. In Liberia, malnutrition is a major cause of death in children under five years old. The Ebola epidemic, which devastated the health system, made it even harder for children to get treated. But now, thanks to your help, children in Liberia are getting the nutrition support they need. Pray for women and children who are suffering from malnutrition. Pray that they can access nutrition services so they can recover their strength and health. In the two refugee camps where we work in Tanzania, malaria is a huge concern for children under five years old. No child should die from malaria, an illness that is both preventable and treatable. Your support is keeping clinics stocked with medicine so children survive malaria. 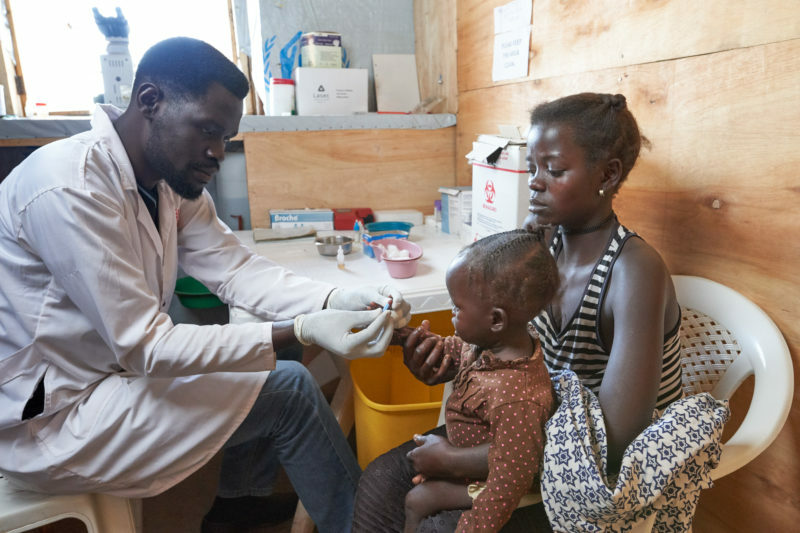 Pray that clinics continue to be stocked with enough malaria medicines and supplies. Pray that children are treated quickly before their illnesses become life-threatening. 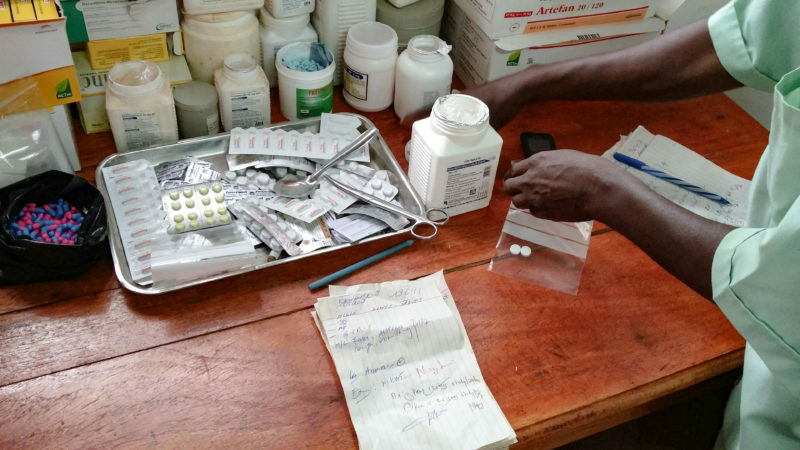 A stock of life-saving medicines at Mtendeli refugee camp in Tanzania. For Syrian refugees in Turkey, mental health services are critical. After experiencing war, refugees are left with emotional and mental trauma. You help provide professional, loving care to people who have lost everything. Pray for Syrian refugees inside Turkey, that they can access mental health services provided by Medical Teams and other organizations. Pray that they find peace and feel the love and care of people around the world. Violence continues to rip northern Syria apart. Bombings and attacks threaten people stuck inside Syria’s borders. Basic health services are few and far between. Imagine the terror of having a sick child in a warzone with nowhere to turn for help. Pray for Syrians affected by the crisis, especially for those displaced and in need of adequate shelter and health care. Pray that clinics and health workers are protected in northern Syria so they can provide critical care. Here at home, many of our neighbors who can’t access dental care suffer from debilitating tooth pain. Mouth disease can lead to even more serious health problems like strokes and heart attacks. Our Mobile Dental vans go to people in need, providing free dental care to relieve pain and restore health. Pray for our neighbors, that their pain is relieved through the generous care of volunteer dental professionals. Pray that they would feel the healing hands of Jesus when they step on our vans. 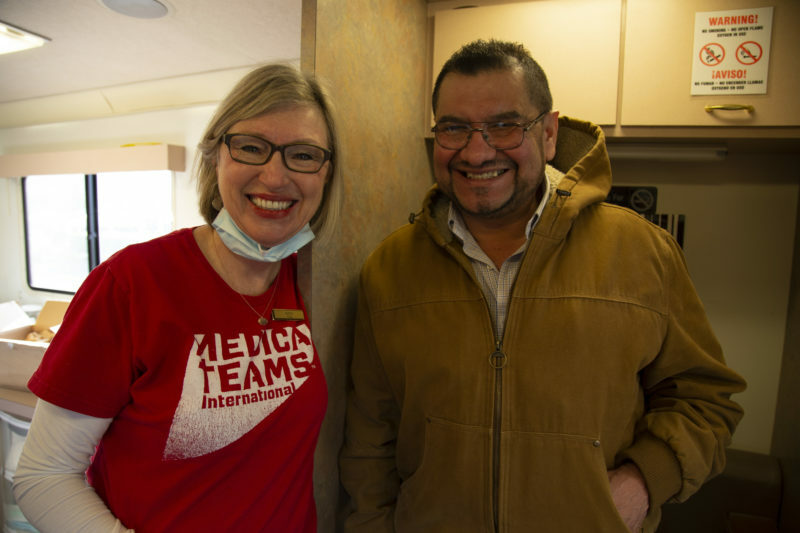 Alberto smiles with volunteer, Kathi, after being treated on board the mobile dental van. In rural Guatemala, much of the indigenous population cannot access health care. Mothers and children suffer the most. Giving birth is especially dangerous, and many mothers and babies don’t survive. 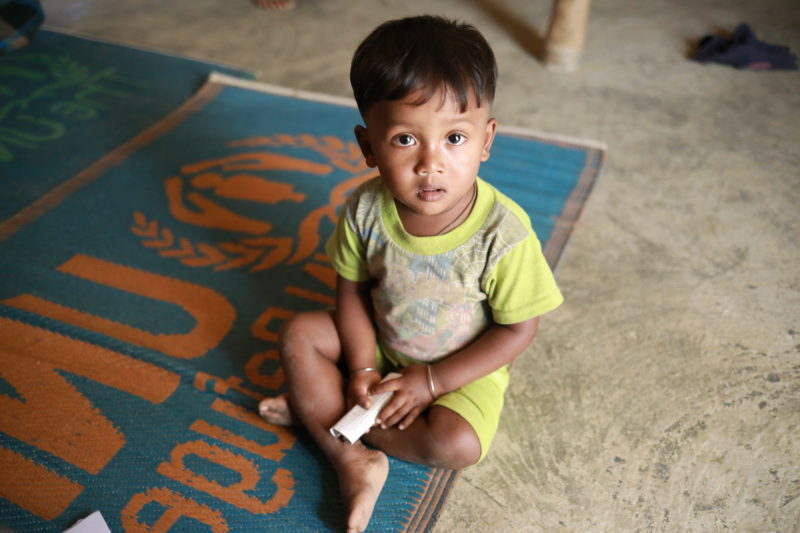 Nearly half of all children under five are malnourished. Basic health education and services can save lives. That’s why, with your help, we’re there to provide health education and training to rural communities. Pray for children and pregnant mothers in Guatemala who are vulnerable to disease. Pray that health care and education reach the people who need it most. Thank you for taking time to pray for our sick brothers and sisters around the world. Your prayers will cover the vulnerable and remind people in crisis that they matter, to God and to us.